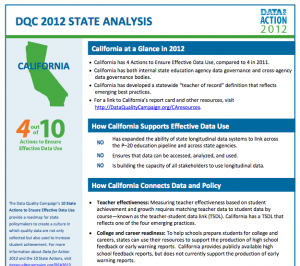 California, in gray, is the only state that didn’t report this year to the Data Quality Campaign’s 9th annual analysis. 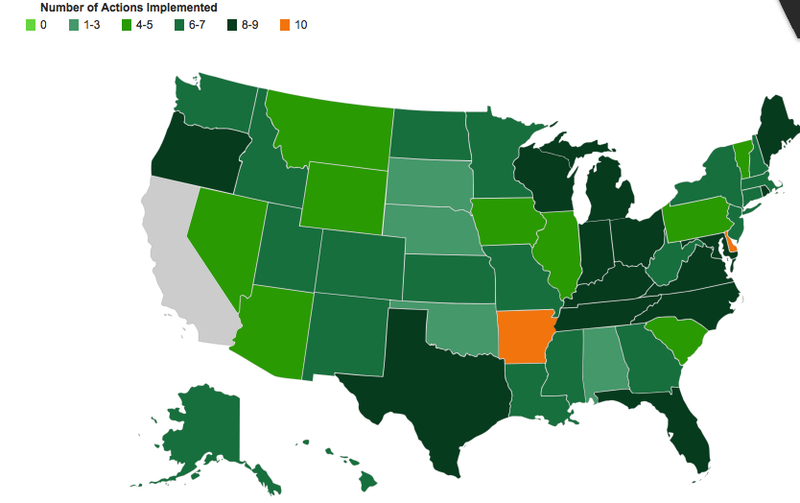 Two states in orange, Arkansas and Delaware, reported a perfect 10 actions to create effective state data policies. California for the first time declined this year to participate in Data Quality Campaign’s annual national survey, creating a hole in the 50-state map marking progress states have made in collecting and effectively using educational data. The results of the 9th annual report were released Tuesday. The survey tracks states’ progress in taking 10 actions the national nonprofit organization has deemed essential to help parents, teachers and policymakers make informed decisions to improve student achievement. These include creating a database that can track students’ progress from pre-kindergarten through college and the workplace, training teachers in how to read and use data to target student interventions, and permitting data access to researchers and universities while preserving student privacy. In 2011, the Campaign started sending the survey to governors instead of state K-12 education departments, because questions also pertain to higher education and pre-K data. Since then, only the office of Gov. Jerry Brown, who has questioned the value of state-collected education data, responded that it wasn’t interested in participating in the survey, with no reason given, said Paige Kowalski, director of state policy and advocacy for the Campaign. The California Department of Education filled out the survey in 2011 and 2012 at the Campaign’s request but wasn’t asked to this year because the questions changed, she said. Local districts and the state, through CALPADS, the California Longitudinal Pupil Achievement Data System, collect much of the data that the Data Campaign views as important and that the federal government requires, such as school attendance, disciplinary actions, grades and demographics. But the state has lagged behind other states in integrating the data and then providing it in useful forms to guide policy and local decisions. CALPADS is a one-way pipeline, collecting information but not making it easily accessible to districts and the public. The state did respond to the survey in 2012. This is a summary of the results. Click to clarify. Preparing students for college and careers is the goal of the new Common Core standards that California adopted and the primary aim of the state’s new school funding system, the Local Control Funding Formula. But the state has not broadened its K-12 data system to include pre-kindergarten, higher education, the workplace and social service agencies to track students’ full educational experience and the factors, programs and experiences that contributed to, or inhibited, their success. That’s No. 1 of the Campaign’s 10 actions, which 18 states have accomplished, four more than in 2012, according to the survey, which relies on states’ self-reporting. Also missing is the creation of a statewide early warning system that alerts schools and teachers when students are in crisis, such as high rates of absenteeism, or falling behind key academic indicators or at risk of dropping out. Some California districts, like Long Beach, have their own databases, but most districts in California lack the capacity, and student mobility demands a state system, Kowalski said. Thirty-one states have early warning systems, according to the survey, 13 more than in 2012. Devising strategies to promote available data, including training non-educators in their use. Brown has been a skeptic of big ed data systems. In 2011, when the state was struggling to get CALPADS up and running on time, he proposed suspending additional federal funding for the system and shifting the collection of education data from the state to local districts. Legislative leaders reinserted the money for CALPADS, but Brown then vetoed $2 million in federal money to create CALTIDES, a complementary database on the state’s teacher workforce. In lieu of a strong state-run system, school districts, community colleges and four-year state universities have formed an alternative, voluntary system: Cal-PASS Plus, the California Partnership for Achieving Student Success. Cal-PASS-Plus is a decade-old collaborative, funded by the California Community Colleges Chancellors Office and run by the San Joaquin Delta Community College District, in which districts and colleges create data-sharing partnerships that have mirrored, on a small-scale decentralized basis, what some states are doing. Arkansas, Delaware, Georgia, Kentucky and Ohio provide teachers with access to their students’ data through secure web-based sites integrating state and local data that can be customized at the district level. The Campaign has tried to reach out to California for years, but the state “doesn’t regard data as the North Star,” guiding its policies, Kowalski said. But she praised the eight California districts who formed the California Office to Reform Education, or CORE, that, with their waiver from the No Child Left Behind law, are building their own extensive data system to share and compare information. CORE is doing this through the John W. Gardner Center for Youth at Stanford University. Maybe next year, she mused, the Campaign will survey the CORE districts as a 51st state. Strong acknowledged that the state has been slow to make data useful to districts and policymakers and failed to give principals and teachers immediate access to data they need. But at the same time, he said he was pleased that Brown agreed to require multiple data elements in the accountability plans that local districts must write under the Local Control Funding Formula. These include data on chronic absenteeism, expulsions and school climate in addition to data on student achievement. 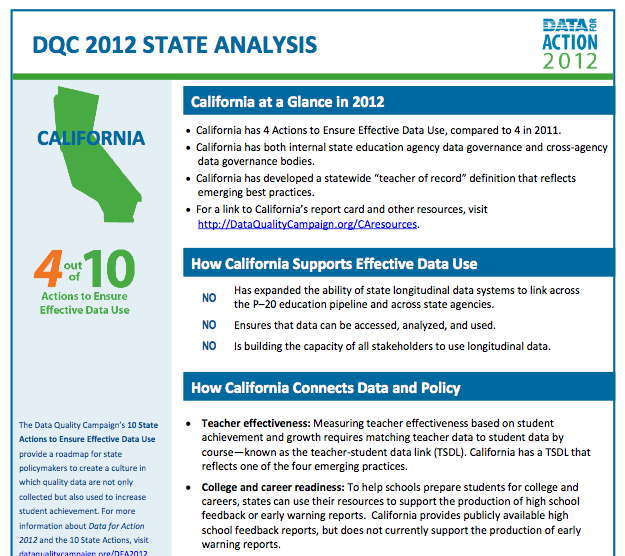 Details of the Data Campaign’s 10 recommended actions and graph of states completion. The board runs the gamut: business execs, Chris Minnich, Council of Chief State School Officers, the director of information for the Nashville Public Schools; Kati Haycock of Ed Trust. The funders are familiar: Gates and Dell foundations, Alliance for Early Success, AT&T, Target and Annie E. Casey Foundation.